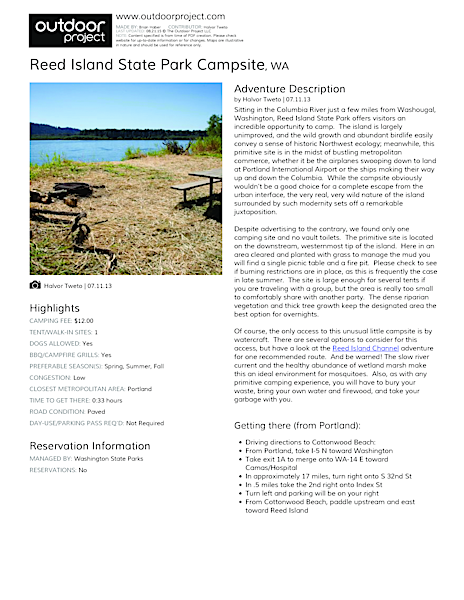 Sitting in the Columbia River just a few miles from Washougal, Washington, Reed Island State Park offers visitors an incredible opportunity to camp. 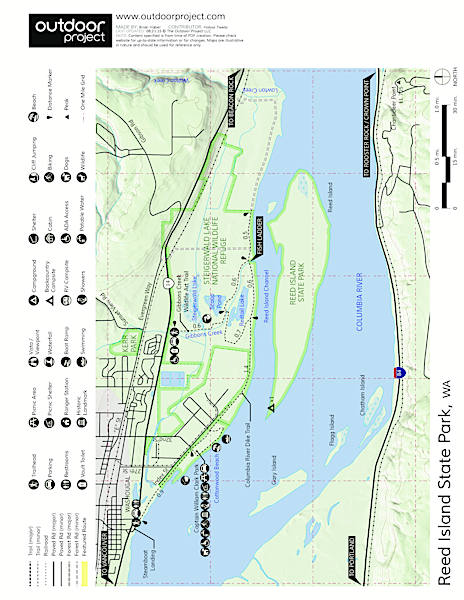 The island is largely unimproved, and the wild growth and abundant birdlife easily convey a sense of historic Northwest ecology; meanwhile, this primitive site is in the midst of bustling metropolitan commerce, whether it be the airplanes swooping down to land at Portland International Airport or the ships making their way up and down the Columbia. While the campsite obviously wouldn’t be a good choice for a complete escape from the urban interface, the very real, very wild nature of the island surrounded by such modernity sets off a remarkable juxtaposition. Despite advertising to the contrary, we found only one camping site and no vault toilets. The primitive site is located on the downstream, westernmost tip of the island. Here in an area cleared and planted with grass to manage the mud you will find a single picnic table and a fire pit. Please check to see if burning restrictions are in place, as this is frequently the case in late summer. The site is large enough for several tents if you are traveling with a group, but the area is really too small to comfortably share with another party. The dense riparian vegetation and thick tree growth keep the designated area the best option for overnights. Of course, the only access to this unusual little campsite is by watercraft. There are several options to consider for this access, but have a look at the Reed Island Channel adventure for one recommended route. And be warned! The slow river current and the healthy abundance of wetland marsh make this an ideal environment for mosquitoes. Also, as with any primitive camping experience, you will have to bury your waste, bring your own water and firewood, and take your garbage with you. Unique location. Wildlife. River and mountain views. Access only by water. No reservations. No amenities. Only one site. Lots of mosquitos!